Sichel is still well known in older wine circles because he was in all the wine societies that people joined before wine broke out into the larger culture. He recorded an album, "Wine with Peter Sichel," which was sampled on a Beastie Boys album in the early 1990s. But he was a bit before my time and I didn't know who he was when I was sent the book. The premise of a CIA spy, a relatively high level one, moving to the wine industry was enough to hook me. Sichel's plain-spoken writing style keeps the hook in. Yet the simplicity of the writing belies a sophistication of thought. Sichel has great empathy: with the Germans, especially right after World War II, with the Bordelais, with his fellow CIA officers. He matter-of-factly explains that serving as a spy leads directly to alcoholism because the spies have no one they can talk to. One of the most interesting books I've read in recent years is "Legacy of Ashes: The History of the CIA," based entirely on declassified CIA and KGB records. That book reveals that the KGB was ahead of the CIA in just about everything. When the CIA thought it was getting one over, decades later they discovered the KGB was feeding them disinformation. You get a sense of how that could happen from Sichel's insidery description of CIA culture. Everybody was upper-class, they all went to the right schools, they all thought the same way. They were out to save the world from itself. They were simply too uniform in thought, and they purged anyone who stood out from the agency. I wonder if Sichel's enlightened position on interfering in other countries' business was something he expressed at the time, or what he learned decades later after watching disasters like the unpopular US-installed Shah of Iran lead to today's Iranian theocracy. He writes, "Societies are delicate structures that have evolved over centuries, and interfering in them with the resources America sometimes has deployed can result in tragic outcomes. In many cases it would be better to leave them alone than to interfere." The CIA section of the book captures plenty about the geopolitics of the 1950s, as well as some of the derring-do of running infiltrators. The opening, in which he grows up in Mainz, Germany and eventually flees occupied France, is more personal. Sichel's father was wanted by the Nazis and their time on the Spanish border was nerve-racking. But leading up to this point was an idyllic childhood with parents in the wine industry who loved him, and a comfortable life with boarding school in England ("I remember that we ate an enormous amount of rabbit") and vacations in Europe. He had the same school headmaster that George Orwell hated, but Sichel got along just fine. Sichel explains that like many German Jews, he identified as a German first. He's not religious and neither is his father, who was sure the family's business ties would protect them from the Nazis. His mother read Nazi newspapers and was urging the family to get out, which they just barely did. My favorite section is probably the brief time he spent with the CIA in Hong Kong just for the lifestyle they lived then. He and his fellow spies would get on Sichel's boat and sail to an island, bringing their personal chefs along to cook for them once there. After he left the CIA, Sichel entered the family wine business for the first time. The family was already making blended bulk wines with a Blue Nun on the label. Sichel saw the potential to make this one of the world's most popular wines, and it was omnipresent within a decade, with millions of cases shipped. 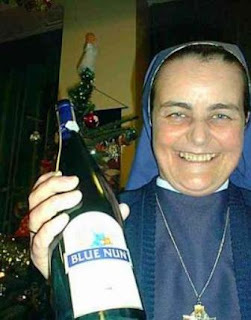 Sichel's matter-of-fact description of the creation of Blue Nun still applies to many popular wines today: "Research showed that a 100 percent Riesling did not do as well as one incorporating other German noble grape types, specifically Muller-Thurgau, Silvaner and often a little Gewurztraminer. Blending also made for a cheaper wine because these other varieties did not command the same premium pricing as Riesling in the marketplace. The degree of sweetness was important since at that time new wine drinkers tended to prefer wines with a degree of sweetness. We decided on roughly 2.5 percent of residual sugar balanced by 6.2 to 6.4 grams of acidity ... Due to the large area of vineyards where the designation Liebfraumilch was permitted, we had a plentiful supply of base wines at more or less steady pricing." It is how the sausage was made. Sichel, the Blue Nun businessman, became one of the best-known wine educators in the United States. He's on a Beastie Boys album! It's ironic to think about people listening raptly to a guy who is just making a product by the numbers. The book fascinated me for 344 of its 371 pages (before index, bibliography, etc.) Then it got real boring, which is a lesson. Sichel writes, "These memoirs would be incomplete if I did not write about my love of wine and give some advice on how to find one's way through the confusing plethora of labels in the marketplace." So he briefly tries to tell the story of wine and how to buy it, giving an electric book a thud of an ending. Who can tell the story of wine? It's too big a topic, whether you use 27 pages as Sichel did or 1027 pages. The story of a man's colorful life, that's interesting. But wine itself is just too vague. I always have this problem when I periodically write the Sake 101 story for various publications. The general topic of sake itself has been done a thousand times, and it's dull. But a story of how an ex-CIA guy made a hit wine from cheap sweet Bordeaux bulk white wine, calling it Wan Fu with a marketing campaign inside fortune cookies ("To eat Chinese without Wan Fu is to eat but with one chopstick") -- that's interesting. I'm so glad you shared this story, Blake. Apropos, I just saw "Smiley's People" (Sir Alec version) on the shelf at the library tonight. I'm also glad to hear your friend Myles is well.